Do you ever feel like you don't choose a project as much as it simply chooses you? It felt that way for me in December when two parcels landed at my door, one included an amazing mini quilt from Adrianne from on the Windy Side, and the other a generous giveaway from Amanda from A Crafty Fox and Westwood Acres. 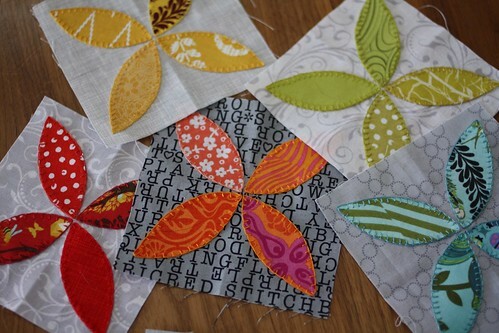 Adrianne's mini was covered in orange peels and she used an appliqué method I had been itching to try - blanket stitch. In the giveaway parcel, Amanda sent nearly a dozen Jen Kingwell Designs patterns, one of which was the midnight at the Oasis Quilt, which prominently features orange peel blocks. It didn't take long for the design to simmer in my head before I cut into my Tula Pink stash. So far my progress has been slower than I hoped but I'm really enjoying the relaxed process and couch time that hand appliqué allows for. I intended to alter three of the borders in this pattern from the beginning but upon learning at my LQS that my orange peels are too large (I guess the new patterns have stickers covering the original peel template and replacing it with a smaller version) - I am now also stuck trying to think up a way to alter the centre block in order to still utilize my pretty blocks. Even Joey is excited about these orange peel blocks... well the floss box at least. Cats are attracted to string, like moths to a flame. Orange peels have been on my to-try list for quite a long time. 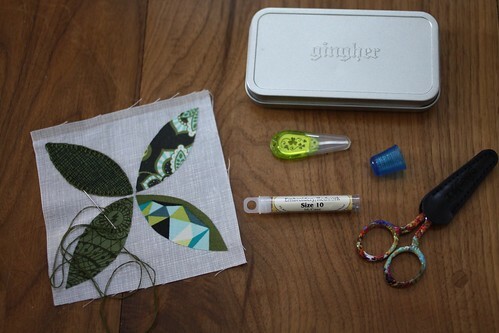 I like the blanket stitch method you are using and hand stitching is so relaxing. Maybe later this year I can try it...I'll be looking back here again to see how yours turns out and hopefully you can post about the experience! Good luck with the fix for the center! Love the colors. 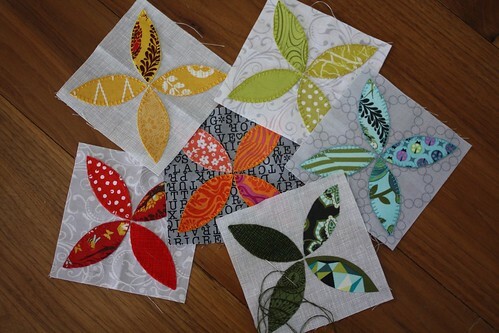 I've never had the patience to try hand applique or piecing. I always worry that I'd get bored or frustrated with it too quickly and NEVER finish. I have been trying my hand at EPP recently though. As for the border issue: could you add a thin solid border between the center medallion and your (very beautiful) orange peels? Nothing like a "mistake" to bring out the creative side of a person! Just let it simmer in your head and a solution will present itself. These are precious! And your blanket stitch is so even and neat! love your blocks! I've never heard of orange peel before, but I love it!! Just might have to try it myself!! I think a blanket stitch tut would be great for those of us applique dummies! Beautiful, btw! Love those orange peels. Your floss box is so tidy - need to do something about mine. Those orange peels are so great! I've always wanted to try them. Kelsey, these are so pretty! 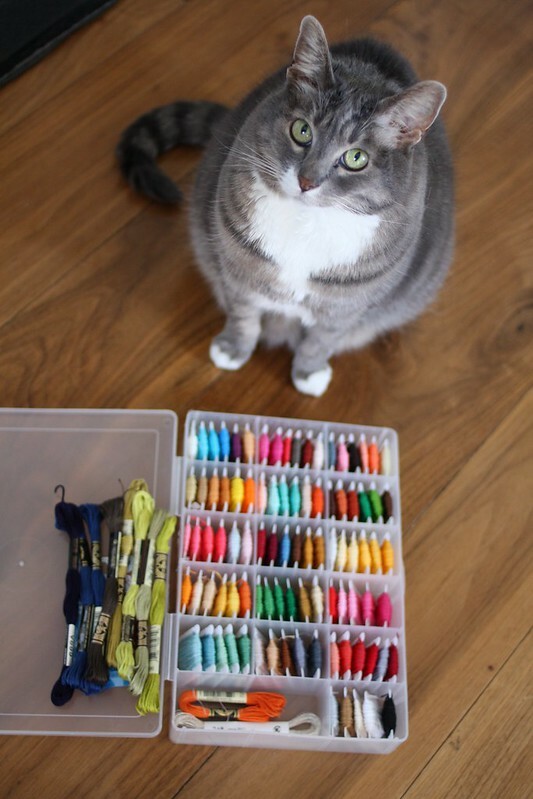 And I love your box of colourful threads! They are gorgeous. Maybe make an improv block the size you need it to be. Gorgeous! 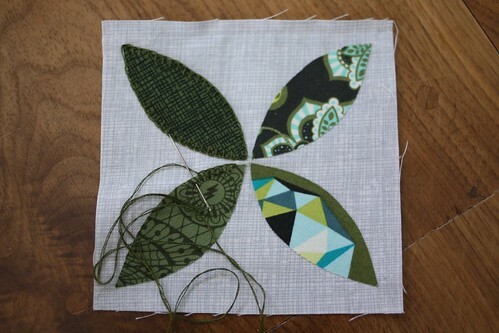 You will figure it out - it is part of being a quilter - making a mistake and then figuring out how on earth to fix it! Your Orange Peel blocks really caught my eye today...they are looking great!!! and, in this busy world, it's really nice to have an excuse to just sit down & stitch!!! Linda p.s. you could always simply continue with them & have an entire quilt!??!? Your orange peel blocks are lovely. I wish I had your patience for doing handwork. If I did, I might have gotten my Christmas quilt done on time for the holiday. As it is, it will be at least this Christmas before it's done. Gorgeous Kelsey! i'm sure you'll figure out a way to make them work, and when you do it will be awesome! beautiful. The cat is beautiful. Hand sewing is beautiful.